Come watch College and Local NFL Football on one of 23 large screen TV's! Come Party With The Crafty Crew, Where We Appreciate You. With 60 Crafty Beers on draft, including local breweries, you're sure to find a new favorite. But Wait! If drinking beer isn't your forte' (ha, really;), you will definitely enjoy our Premium Cocktails including Titos, and Wine. But WAIT Again! Before you leave, bring the party to our NEW CRAFT BEER & WINE BOTTLE SHOPPE located right next door. Our parking is perfect when you want to grab a few six packs before heading to the Park, on the Water, or even to visit those pesky (oops!) I mean awesome relatives! With over 650 varieties of Craft Beer, that you can drink here or buy in singles, and a growing selection of Wine and Wine Beverages, we ARE your Craft Beer Emporium! Now selling Cigars! Mmmm Mm! See You Today, My Crafty Friends! 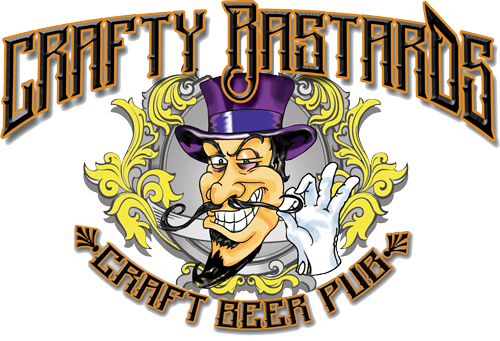 For updates on our Weekly Beer Tastings, New Food Specials, and more, text "crafty" to "43506"
or follow us on our awesome social media. 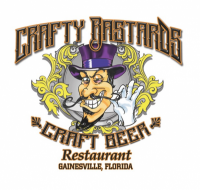 © 2019 Crafty Bastards -- Craft Beer Restaurant & Pub. All Rights Reserved.